This appendix describes problems with various aspects of ADF Mobile applications, as well as how to diagnose and resolve them. Section A.1, "Problems with Input Components on iOS Simulators"
Section A.2, "Code Signing Issues Prevent Deployment"
Section A.3, "Missing Android SDK Tools File Prevents Deployment"
On ADF Mobile applications deployed to iOS simulators, text entered into one <amx:inputText> component field becomes attached to the beginning of the text entered in subsequent field when navigating from one field to another using a mouse. 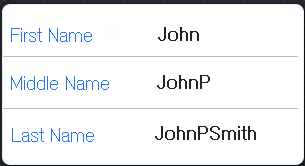 For example, on a page with First Name, Middle Name, and Last Name input text fields, if you enter John in the First Name field, then click the Middle Name field, and enter P, the text displays as JohnP. Likewise, when you click the Last Name field, and enter Smith, the text in that field displays as JohnPSmith, as shown in Figure A-1. This behavior only occurs on iOS simulators and in web pages, not on actual devices. Use the keyboard on the simulator to traverse the input text fields rather than the mouse. In some iOS development environments, ADF Mobile application deployment fails because of code signing errors. For more information, see codesign_allocate(1) OS X Manual Page and OS X ABI Mach-O File Format Reference, both available from the iOS Developer Library (http://developer.apple.com/library/ios/navigation/). [07:54:28 PM] ---- Deployment incomplete ----. Verify that the location defined in the Android Build Tools Location field of the ADF Mobile Platforms page references the directory that contains the aapt file (aapt.exe on Windows systems). For Revision 22 of the Android SDK, this file, along with all of the other build tools components, is located within the build-tools directory. For earlier revisions, the build tools components are located in the platform-tools directory. For more information, see Section 17.2.3, "How to Create an Android Deployment Profile." See also Exploring the SDK, available from the Android Developers website (http://developer.android.com/sdk/exploring.html).